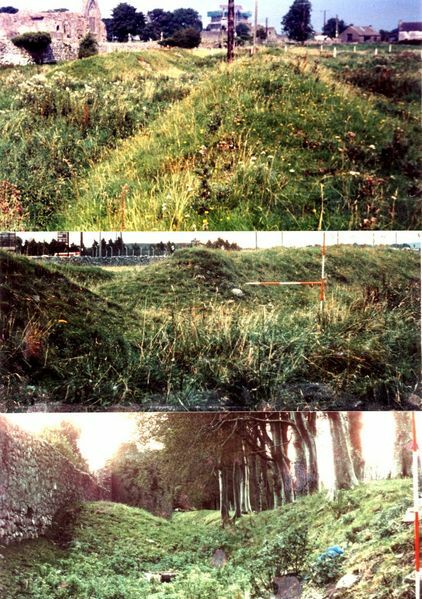 King Eochaid Ferach Mhor commissioned Tinni Mac Conrach and his Domnann tribe to erect Athenry's Rath Cruacha linear embankments (the town's N wall stands on a segment; lower photo). He later enthroned his daughter Medb as Queen of Ol nEgmacht there. Medieval pseudo-history transplanted Eochaid to Tara and Medb to Rathcroghan of Roscommon (Ref: Eriu ii, 178).